Here at TracfoneReviewer we share news, reviews and promo codes! Take a look around if you're new! All cell phones include a camera which is very convenient for snapping photos of friends, family and daily life, but can be annoying when the photos don't turn out very well. Cell phone cameras are improving, especially for high end smartphones, and more and more people are relying on them to record important events and memories. But we have all probably experienced trying to capture a moment only to see the image turn out poorly. 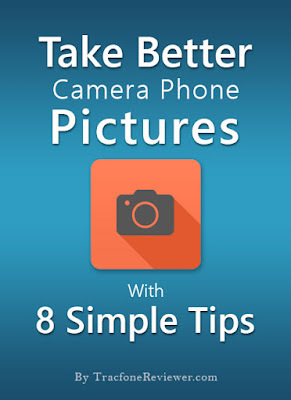 Well we are sharing our best tips to help you capture better photos with any cell phone camera. Budget phones are still capable of capturing good photos and these tips will help you do that! Just about every camera app should have an option in the settings to display a 3x3 grid over the screen. This is helpful for a number of reasons, particularly photography's 'Rule of Thirds' which says that the intersecting points of the 3x3 grid is where you should put the main subjects in your photo. Additionally the grid is helpful for keeping the horizon level. 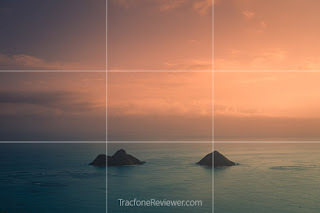 See the image on the right and how the grid helps line up the islands in the photo and keep the horizon level. Many a photo has been ruined by a smudged or dirty lens and quick wipe before you go to take a shot can go a long way in avoiding one possible reason your photo didn't turn out as well as you were hoping. The edge of a t-shirt or other soft cloth is great for this and don't forget to wipe the lens on the front of the phone for selfies. Many phones now also have a flash which is helpful for lighting up night scenes. However, flash can also leave parts of the photo overexposed and nasty shadows. Try turning the flash off and shooting with the available light first, and use flash as a last resort. Your photos should look more natural and people in your images will appreciate not getting blinded. Photography is all about light but you don't need to be a great photographer to understand light, simply look for ways to have the subject in your photo positioned so they make use of the light available. For example, if you are inside a room with a window, try positioning the subject so that the light from the window falls on their face and naturally brightens it. Try to avoid bright lights behind your subject as they will tend to cause your subject to be too dark. Taking a moment to reposition your subject before shooting can go a long way towards creating a better image. If you are taking pictures of a landscape, sunrise and sunset are the preferred times to shoot as the light is the most unique and softer than mid day. Although cell phone cameras have zoom, don't use it (as much as possible). It is much better to move your feet and get closer rather than using the phone to zoom as the quality of the image will degrade significantly. Most cameras allow you to tap/touch to focus on a specific subject in the photo and this is great for shooting any closeups. Additionally, this may help your camera expose more properly for the subject you are shooting. Keeping the camera steady goes a long way to getting a sharp image. Hold the phone with both hands when possible, and even try bringing your elbows in towards your body to add more stability. You can also try setting the phone on a table or railing to help stabilize further. 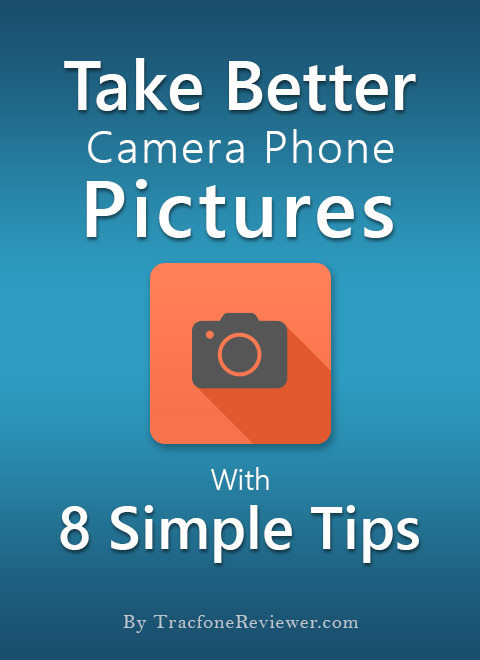 Another great tip is to set your camera's timer for two seconds to further avoid shaking the camera. Going beyond an Instagram filter and actually editing your photo can make a noticeable difference and sometimes recover details in an over or under exposed image. There are lots of free and paid apps for photo editing, but we have found the free LightRoom Mobile app is very robust while also fairly simple and gives users significant control over photo editing. Did you know you can download other camera apps to take over form the standard camera app that came with your phone? This can be really fun and helpful if you are looking for certain features or just want to try something new. That's it for our cell phone photography tips, we hope these will help you shoot better images! Leave a comment below with any questions or your own tips! Join us on Facebook with a community of over 3000 members where we share the latest news and reviews and are available to answer your questions. Looking to upgrade your phone? See the best Tracfone Deals, Discounts and Sales on smartphones and unlocked devices or visit our Latest Tracfone Smartphone List (2018) for all the new phones available. i know you may or may not have any real connection with tracfone, but i just have to say: after trying to reach a real person NOT by phone there is no way to get customer care anymore. it's all run by bots! this may be the last straw for me and tracfone. stop bragging on how great you are and start proving it! Hi Peter! These are some great tips =) This may be a little weird, but I've been a fan of your blog for a veryyy long time, probably since my first TF android days (ZTE Valet), anyway.. I have never realized this before, but I've also been a fan of your photography!! I don't know how it slipped my mind that you and the photos you took.. is actually, well.. YOU! LOL! I just noticed this revelation 2 weeks ago when you posted a beautiful photo on OHC FB Group! (Yes, I'm part of that group! lolz, sounding stalkerish right now) Thinking.. this name looks familiar, where did I.... OMG! Tracfonereviewer! ONE DAY, I'll figure out which photo I want.. and make a purchase... I was actually drawn to one in particular, but all of them are so beautiful! Can't decide!